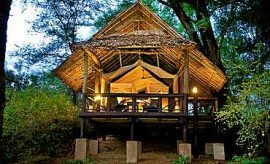 Best Time & Weather To Travel To Samburu? Scroll Down For Details.. 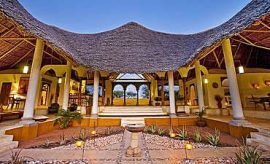 The arid and semi-arid landscape of Samburu National Reserve offers our guests an amazing African wildlife vacation any time of year. 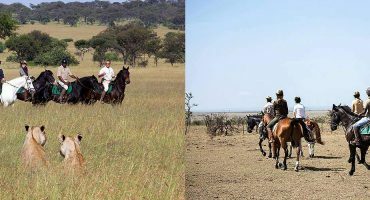 To maximize your game viewing and safari activities, AfricanMecca recommends that you consider some climatic aspects of equatorial Kenya. 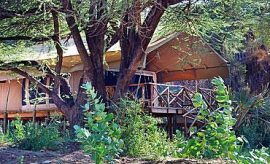 Maximum daytime temperatures in Samburu can be hot for some guests, so some safari activities are not optimal during the hottest parts of the day. Daytime highs range from 84 F (29 C) to 90 F (32 C) degrees and nighttime lows swing from 61 F (16 C) and 66 F (19 C) degrees depending on the month of travel. 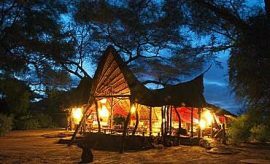 As the sun sets, temperatures drop, so we recommend that you bring additional layers of clothing, such as a fleece or sweater, to fend off the chilly night air; though, it does not get very cool in Samburu compared to highlands of the Great Rift Valley – Masai Mara, Lake Nakuru or Naivasha, Amboseli etc. 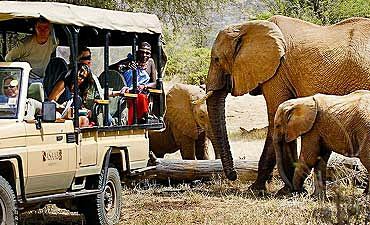 Other aspects of your outdoor tour of Samburu that are affected by the weather are wildlife experiences and logistics, as these vary during the dry and rainy seasons. We consider the long dry season from July to October to be the best time to visit Samburu Reserve. You enjoy sunny, blue skies with almost no rain. 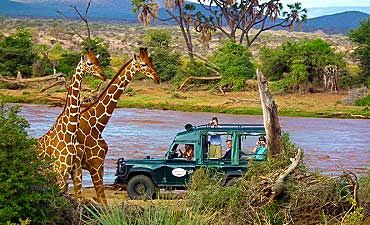 Water sources are limited due to the absence of rainfall, so the animals congregate along the Ewaso River to drink and feed. Vegetation is limited, making wildlife easier to locate and observe. Additionally, the roads are dry and easy to navigate. 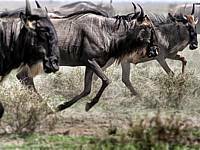 This time of year, though, coincides with Great Wildebeest Migration in Masai Mara and also summer break for American and European families, so visitor levels are highest though not at the same level as the Mara. The short rains arrive by late October into November and December. Visitor levels tend to be lower than peak season, but road conditions may be less than optimal. 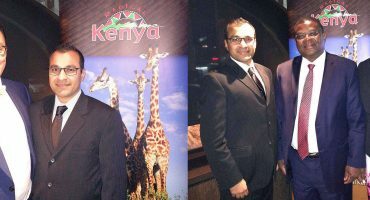 Last two weeks of December are also when some guests plan their Christmas and New Year’s travel in Kenya, so visitor levels slightly increase during these festive holidays. The short dry season in January and February is followed by the long rains from end of March through May, dusting off by middle of June. Sometimes, rainfall is limited to short afternoon and evening showers, having some impact on your safari activities. While road conditions may be the most challenging on some days, especially in April or May, the reserve sees new life in every area. Flora springs from the dry-hot hibernation and some mammalian species, particularly antelopes give birth to benefit from more water and food. This time of year is also the low tourism season. 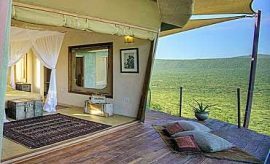 Accommodations in Samburu offer reduced room rates although the costs associated with logistics, conservancy - park fees, activities and other supplemental costs are constant year-round. Also, note that the long rains coincide with the Easter holiday week, a time when many Kenyan residents, families and solo travelers plan shorter trips around Kenya and also to Samburu. 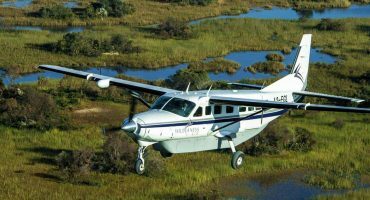 For the finest birdwatching, AfricanMecca vouches that you visit the reserve from October to April when resident avi-fauna are joined by migratory species. 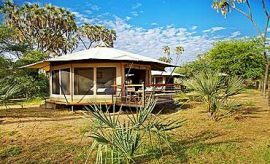 The 165-square kilometers Samburu National Reserve is located northeast of Laikipia and is home to some of Africa's rarest flora and fauna with unrestricted access to rugged East African wilderness.